One thing investors ask me about all the time is return of capital, or ROC. In a nutshell, these folks are mainly worried that ROC is simply a fund taking your money and paying you a dividend from your money without actually making a positive return on it. Worse, they’re doing this after taking out their fees, which are much higher than the fees you’d pay on an index fund! Before you get your pitchfork out, know that this perception of ROC is wrong. In reality, return of capital is often very good for investors. For starters, ROC isn’t simply a fund taking your money and giving it back to you. It’s a tax strategy to minimize your bill to the IRS at the end of the year. You see, funds use a complex method of tax-loss harvesting and capital-gains capture to minimize capital gains taxes for shareholders. A knock-on effect is that this will also boost returns, in many cases, since the fund is selling off underperforming assets and taking profits from good investments at the same time. So you can often think of “return of capital” as a synonym for “prudent portfolio management. But like children railing against medicine that’s good for them but doesn’t look appetizing, a lot of CEF investors rail against something that’s actually saving them money. In fact, many funds that have a large amount of ROC are big market outperformers. Read on and I’ll show you a couple and explain why ROC is the last thing we should look at in both cases. 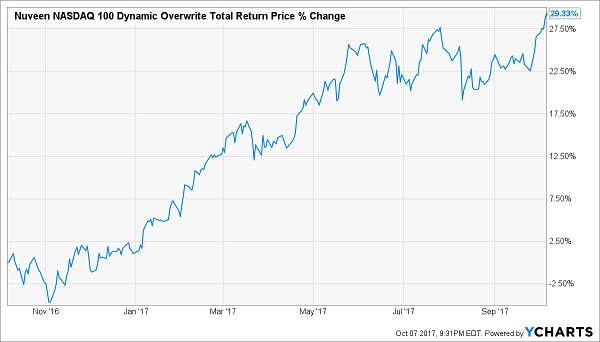 Let’s start by taking a look at the Nuveen NASDAQ 100 Dynamic Overwrite Fund (QQQX). If we look at the fund on the surface, a lot of alarm bells start ringing. For one, its net investment income (NII) is far lower than its dividend. In fact, the $0.0766 per share of NII it’s earned year to date is a measly 7.2% of the total dividends paid out. And the fund just raised its dividend 5.7% in September! What business does this fund have raising its dividend if its income only covers a small fraction of it? It looks even worse for QQQX from an ROC perspective. 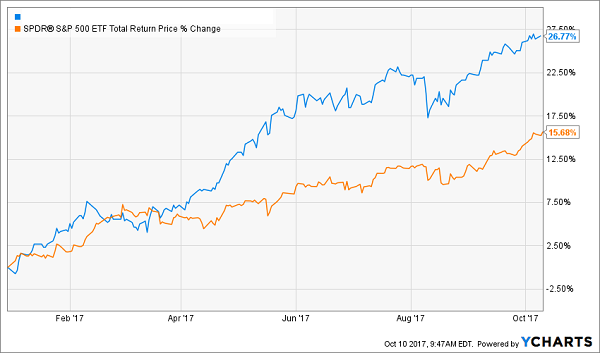 ROC made up over 85% of the fund’s dividends for 2017, so if you followed the common “wisdom” that this fund is just taking your money and giving it back to you after fees, you can easily feel ripped off. Underearning payouts and giving our cash back to us after charging fees? Clearly that’s a dividend trap ready to spring, like the 237 funds my colleague Brett Owens just recommended avoiding like the plague. You would also be missing out on a solid 7.5% dividend yield that grew once over this period and is likely to grow again. The reason you missed out? You didn’t realize that this fund is doing a great job of rotating its portfolio and turning capital gains into ROC in the tax man’s eyes. The answer is—no, not really. If you just wanted to buy some bonds and collect coupons (that’s what dividends are called in the bond world, by the way), you could do that yourself. But you wouldn’t get access to the cheap leverage CEFs get and you’d lack the research tools BlackRock, PIMCO and other big companies have. But you’d still get your coupons. In reality, investors don’t buy bond CEFs just for the dividend payments. The best bond funds use a variety of derivatives to hedge risk, boost income and diversify their portfolios. The problem is that the cash flow from those derivatives is classified as capital gains from an accounting standpoint, so again the fund will need to optimize its portfolio allocation to help investors reduce taxes. But that means distributing “return of capital” that, yet again, terrifies first-level CEF investors. Thus you get a fund like the Eaton Vance Tax-Advantaged Bond & Option Fund (EXD), which uses ROC to cover 91.6% of its dividend. Look just at the ROC on its own and you might think EXD’s 9.8% dividend yield is a sucker’s bet. Add on top of this the fact that it has one of the highest negative undistributed net investment income per share numbers of all bond funds (-$0.529 of UNII—more than half a year’s distributions!) and you’d be tempted to laugh at EXD shareholders. But that’s okay—because they’d laugh right back at you. A Clear Sell? Maybe not! Again, the simple reason for the confusion over return of capital here is in the fund’s strategy. Note the “tax-advantaged” part of EXD’s name? This fund is specifically designed to rotate its portfolio to optimize ROC payouts. It does this to lower the tax burden of investors—and it does it very well! 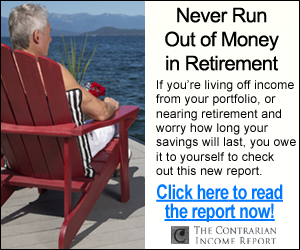 This “Instant” 4-Fund Retirement Portfolio Yields 7.4%! 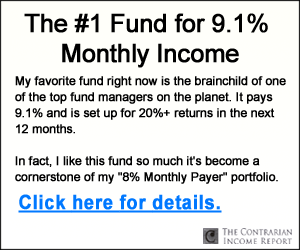 One of my top CEF picks counted 83% of its last dividend payout as ROC. And despite what the first-level crowd thinks, this means it’s doing exactly what it should be doing—smartly managing its portfolio to cut your tax bill and maximize your gain. 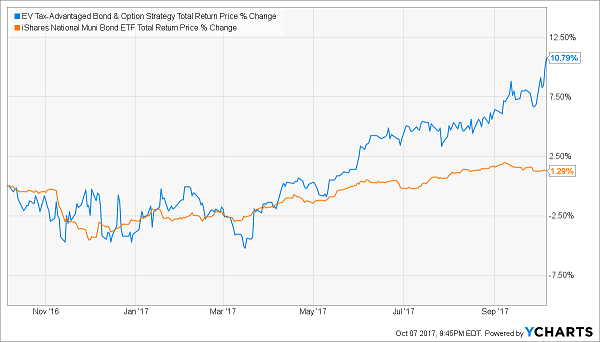 Check out how this unsung CEF, owner of some of the world’s best dividend stocks—Altria Group, Johnson & Johnson and Cisco Systems among them—has absolutely manhandled the market this year, with dividends included. What’s more, thanks to the fund’s stout dividend payouts (current yield = 7.0%), a BIG part of that gain was in cash! Best of all: it still has lots more room to run from here. Together, these 4 unsung CEFs form an “instant” 4-fund retirement portfolio. You get unbeatable diversification—dividend stocks, municipal bonds, real estate, domestic and foreign stocks—in a 4-fund set that holds fast when market storms hit—and obliterates the market when traders turn bullish! For that, you can thank their (totally unusual) discounts and their sparkling 7.4% average dividend yields. As I just said, I put everything you need to know about these 4 stealth funds in an exclusive report, which is waiting for you now. Don’t wait. Go right here to get your copy and uncover these 4 cash machines’ names, tickers, buy-up-to prices and my complete research.